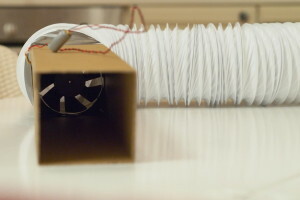 The fan is hot-glued into a card-board tube which also allows easy positioning of the fume extractor. 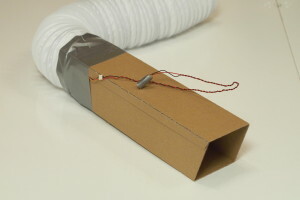 The flexible tube attached to the end is long enough to reach out of the next window, so no fume filtering is needed. This is a great tip! I love that solder smell on my pillows! In all seriousness, this is ironic because I just made nearly the same setup just a few days ago – hot glue and all. I opted for the other direction for my cardboard where that piece goes out the window. Any particular reason for the choice of direction? Nice 🙂 Mine is running on 24V from an old laptop power supply.